i was singing this classic French song last week while i was visiting Montréal! i took a couple days to rest at Fratérnité Sacerdotale, a retreat spa house for priests and religous. although when i arrived i had much difficulty driving the streets of my country - they had a major snow storm a few days prior! ouch! - is an understatement. there was so much snow - how much snow was there Fr. jon? - indeed, so much snow that what are normally two-way streets became one-way streets! insane in the membrane! the city needed time to do what it had to do - in other words, "deal with it", is what i was thinking while driving here and there. anywho, it didn't stop me from visiting friends, and visiting the lonely mountain. no - not the Lonely Mountain from The Hobbit: An Unexpected Journey, but l'Oratoire St-Joseph du Mont Royal (EN, FR). today we celebrate St. Brother André (EN, FR). i always enjoy visiting The Oratory, praying St-Jospeh for families, and for husbands and fathers in particular. Brother André had a great devotion to St. Joseph, and encourages us still to go to him. the chaste spouse of Mary, Mother of God, will always intercede for us! so, St. 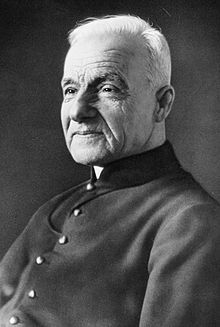 Brother André of Montreal, pray for us! St. Joseph, pray for us! peace.